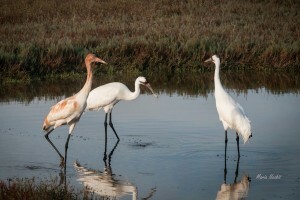 Whooping cranes need “stopover” habitats during their 2,500 mile migration between Canada and the Texas coast. Friends of the Wild Whoopers (FOTWW) has initiated a “stopover” habitat project to help Whooping Cranes during their two annual migrations between Canada and the Texas coast. Stopover habitats are essential so Whooping Cranes can rest and feed during their long migrations. FOTWW contends that it is imperative that we provide more help to the only wild Whooping Cranes population remaining on earth. The wild Whooping Crane population nests in Wood Buffalo National Park, Canada during spring and summer. After their chicks fledge, they migrate 2,500 miles through the middle of the U.S.A. to Aransas National Wildlife Refuge on the Texas coast where they spend the winter. During their migrations the cranes must stop a number of times due to a variety of reasons including nightfall, fatigue, hunger or turbulent weather. These wild cranes have faced numerous threats over the years and hazards are continuing. We know that wild Whooping Cranes can take care of themselves if they have good habitat. FOTWW is working to assure that crucial “stopover habitats” are identified, maintained and developed. During migration Whooping Cranes often stopover on private lands, wildlife areas and possibly some military bases. Regrettably many private lands have lost “stopover” habitats due to more intensive uses or development. 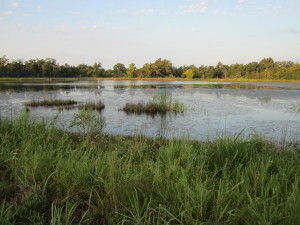 Camp Maxey, Texas Army National Guard pond serves as “stopover” habitat. FOTWW-GCBO made minor management recommendations for improvements. FOTWW contemplated whether our nation’s military lands within the migration corridor could provide some additional relief? Could some of these lands be developed and/or managed to provide “stopover” habitats for our endangered Whooping Cranes? Importantly, habitats for the cranes also benefit many other species of wildlife and fish. And our military installations are obligated by federal laws to manage their lands to benefit wildlife and other natural resources. FOTWW prepared a proposal to evaluate wetland habitats on military installations and met with the Department of Defense Partners in Flight (DODPIF) to discuss the issue. DODPIF sanctioned our proposal and assisted us in making contacts with appropriate officials on military installations within the migration corridor. We are currently working with military natural resource managers to identify existing good quality Whooper habitats, to improve poor habitats and develop new habitats where needed. Until we initiated this project officials on military bases were largely unaware of Whooping Crane needs or that they could play an important part in managing them. The most expensive part of establishing or improving habitat is land cost. If “stopover” habitat projects can be provided on military lands, the cost would be relatively minimal. Importantly, no habitat projects would be allowed that would be incompatible with military missions. “Stopover” wetland pond on Texas Army National Guard Camp Bowie. 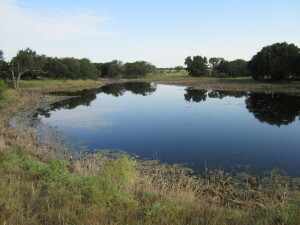 FOTWW-GCBO classified this pond to be in excellent condition currently. To make matters more challenging, Whooping Cranes require “stopover” habitats with some rather specific features. Generally they prefer roosting sites located in small wetlands, ponds and streams with some shallow water and shorelines with sparse vegetation. Such site specific wetland-pond habitats, once abundant are now becoming scarce. Whoopers need secure stopover habitats throughout their 200 mile wide migration corridor about every 50 miles in every direction to help assure safe migration. FOTWW invited Gulf Cost Bird Observatory (GCBO) to be our partner in the project because of their experience with Whooping Cranes. Our FOTWW-GCBO team has recently visited six military bases to determine where marginal habitats areas can be improved by proper management or new habitats developed. We have discussed needs with base officials and provided written recommendations that will protect and improve existing habitats or develop new stopover habitats for Whooping Cranes. Natural Resource personnel stationed on the military installations guided us around the bases and we discuss potentials and possibilities. We have already identified lots of potential stopover habitats. Management recommendations have been made for each specific site that can be rather easily and inexpensively converted into excellent “stopover” habitats. Base personnel have agreed to carry out our recommendations as soon as practical. Hopefully they will be implemented in the near future. Our FOTWW – GCBO team has made some important initial strides but we still have more installations to visit. Hopefully our efforts will continue to be productive and compatible to our military partners. 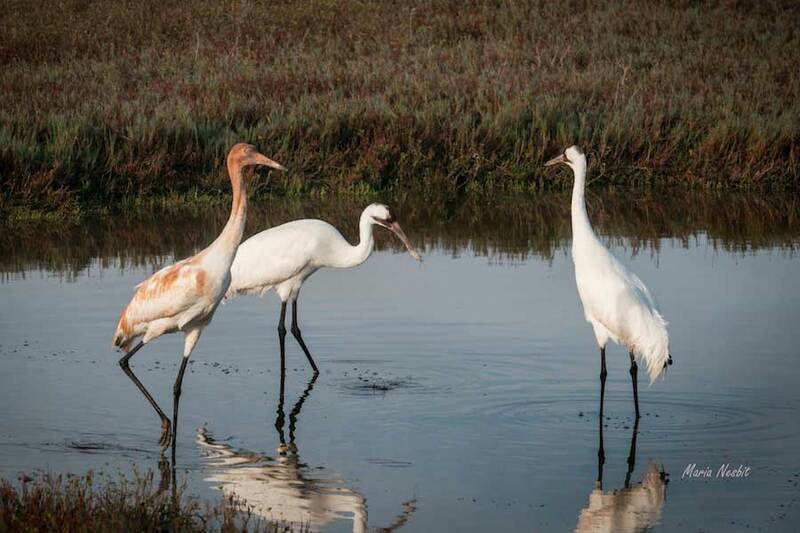 This project will result in improving and developing many more suitable wetland “stopover” habitats for the wild Whooping Cranes as they migrate 2,500 miles from their Wood Buffalo nesting grounds in Canada to Aransas National Wildlife Refuge on the Texas coast. 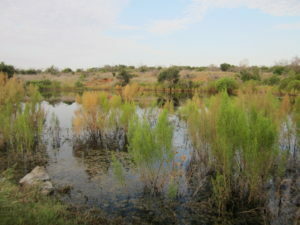 “Stopover” wetland pond on Texas Army National Guard Camp Bowie. FOTWW-GCBO classified this pond to be in good condition currently. FOTWW-GCBO has prepared reports for each military base visited. Our reports identify sites that are suitable now, or that can be developed into “stopover” habitats. We recommend management actions needed to maintain and improve each site. Officials on each military base will be responsible for protecting the wetland ponds and for implementing our recommendations. We will assist them when possible. Today, however wild Whooping Cranes are continuing to face numerous threats to their habitats. In addition to the need for “stopover” habitats more secure wintering habitats are needed along the Texas coast. We invite you to be a partner with us in this important stopover habitat project. We need you. FOTWW’s travel expense (motels, auto expense, and meals) cost an average of $230 per day. You can send us a donation by check or PayPal. Please click on https://friendsofthewildwhoopers.org/support-fotww/ . Then at top of screen click on “Support FOTWW” and then “become a Friend (member) of the Wild Whoopers”. THANKS. What an excellent initiative! I am very happy that you will be helping with saving and creating habitat for the wild flock. I never would have thought about there being habitat on military bases. I am glad that you came up with this wonderful idea and put it in motion. Good luck on your venture. You have my support! This is a wonderful project and needs to be done! I am elderly, retired-without-pension from my own 501 c3, living on SS, and cannot afford to send money. I hope lots of others can….